2000 AD / Rebellion are delighted to announce a second printing of the sold-out graphic novel, Durham Red: The Vermin Stars. The book, originally released in November 2003, sold out its entire first print run in just three weeks - and the second printing looks set to fly off shelves just as quickly! 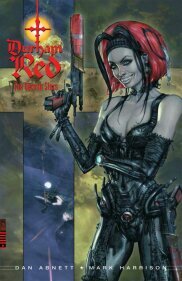 Rebellion's graphic novels editor, Jamie Boardman, says "I'm thrilled that Durham Red has sold so quickly, but not entirely surprised - Dan Abnett is a great writer, and combined with Mark Harrison's astonishing mix of CGI and painted art, it's a hell of a partnership!". You can order Durham Red: The Vermin Stars via Diamond Previews (order code AUG032438), from Tharg's Future Shop, or from bookshops via the ISBN code, 1 90426 508 1.